Black mothers and fathers across the country at some point have had to have “the talk” with their sons, to teach them how to act when encountering police, and most importantly, how to stay alive. 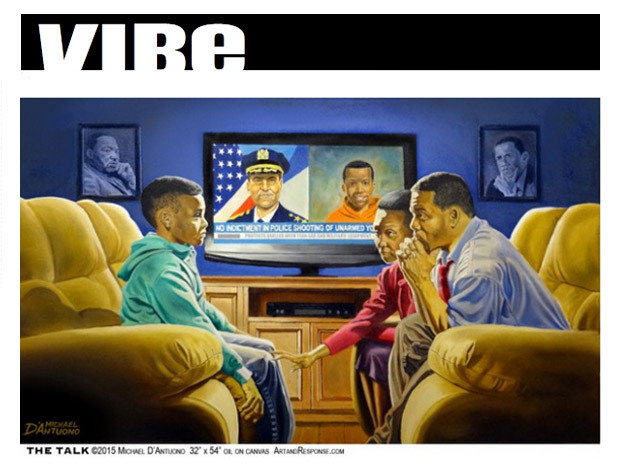 Artist Michael D’ Antuono created a powerful painting portraying what many African-American parents experience when trying to explain to their sons the gross injustice surrounding the killings of Trayvon Martin, Mike Brown, Tamir Rice or the many other young black men killed by the hands of law enforcement. In the portrait titled “The Talk” the television screen shows a split frame of a now deceased smiling black boy wearing an orange hoodie and a white police officer with the words “No Indictment In Police Shooting Of Unarmed Black Youth” scrolling along the bottom of the television screen. On the walls of the home photos of a straight faced Dr. King and President Barack Obama hang, and while Antuono doesn’t show anyone speaking in the portrait, one can see the parents struggling to find the words. Antuono–who studied at the Parson’s New School of Design– took to his Facebook page to discuss the progress, or lack their of, that has been made in regards to race relations in this country. “I doubt Dr. King dreamed in 2015, African-Americans would still need to warn their young sons about the dangers of being black,” he said.